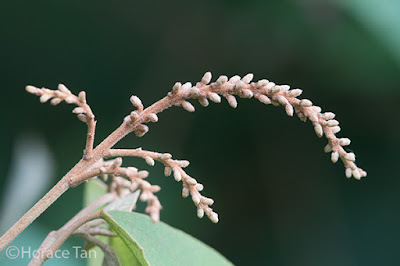 This 5th instalment of our Butterflies' Larval Host Plants series features Turn-in-the-wind (Mallotus paniculatus), a species in Euphorbiaceae (spurge family) which is a large family of flowering plants with about 7,500 species. The members take on a variety of growth forms (trees, shrub, herb) with some having considerable economic significance (for examples, the Rubber Tree, Cassava and Castor Oil Plant). Turn-in-the-wind is a member which assumes the shrub and tree form. The name "paniculatus" refers to the branched state of the inflorescence. 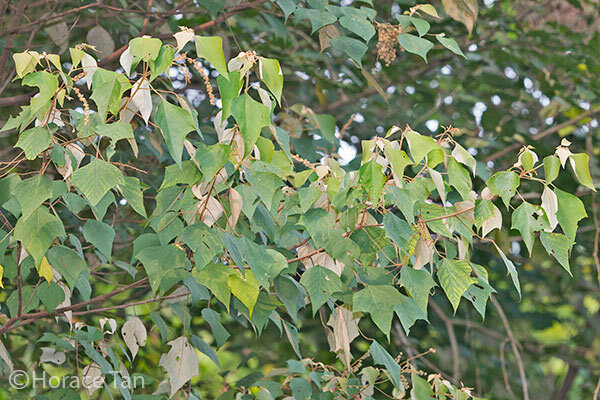 Turn-in-the-wind is native to East Asia, Southeast Asia to North Australia. 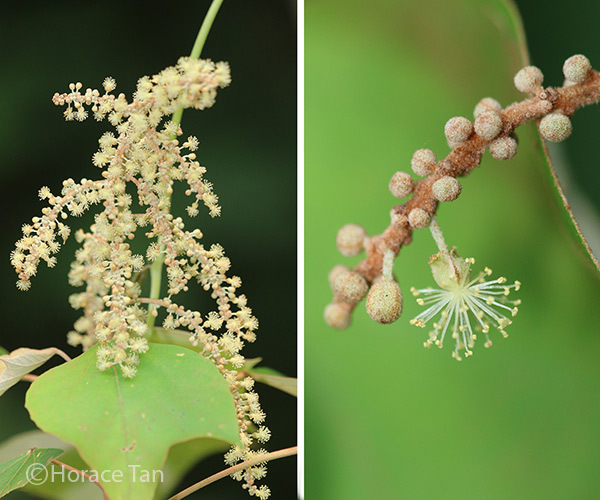 In Singapore, it is a common plant which can be found in multiple habitats including secondary forest reserve, wastelands. hill parks and gardens. 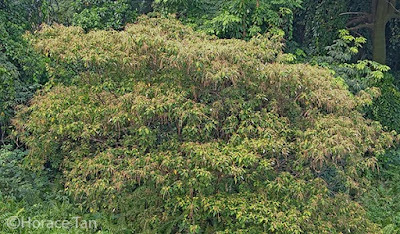 Turn-in-the-wind proves to be a useful plant to human in various parts of the world. For examples, the root and leaves have medicinal uses while the bark and wood have been used in construction, making strings, matches, packing cases and paper pulp. Larval Host for Butterfly Species: Megisba malaya sikkima (Malayan), Semanga superba deliciosa, Rapala pheretima sequeira (Copper Flash), Rapala dieneces dieneces (Scarlet Flash), Allotinus unicolor unicolor (Lesser Darkwing), Logania marmorata damis (Pale Mottle), Mooreana trichoneura trichoneura (Yellow Flat). Left: A young plant of Turn-in-the-wind, about 1m tall. Right: A small tree form of the Turn-in-the-wind, about 3m tall. Turn-in-the-wind is an evergreen plant which appears in shrub to small tree form up to 15m tall. The leaves are simple and tripli-veined (where the lowest pair of veinlets are much more conspicuous than others above them) and are arranged in alternate to apically subopposite manner. 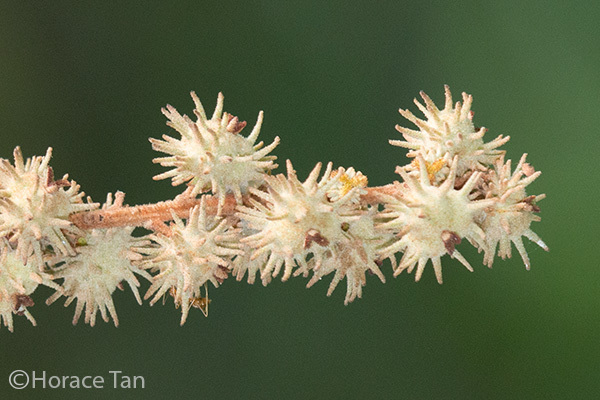 The petioles are greenish tawny and rather long. The young leaves are initially reddish brown. The reddish brown young leaves. 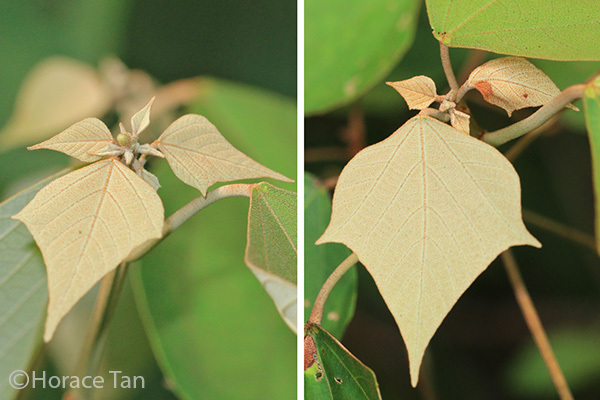 Leaves of the Turn-in-the-wind, showing the leaf arrangement and long petioles. 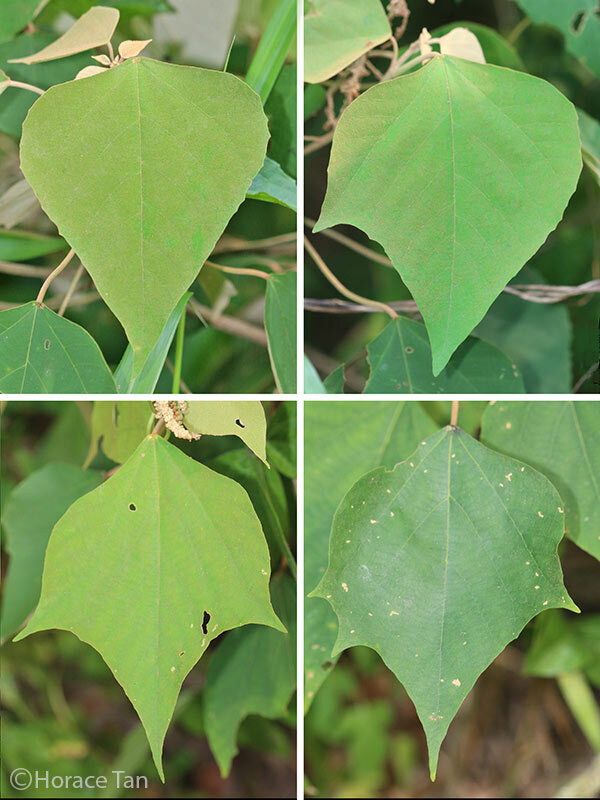 Mature leaves are yellowish green to green on the upperside, whitish on the underside, and up to 15cm long. 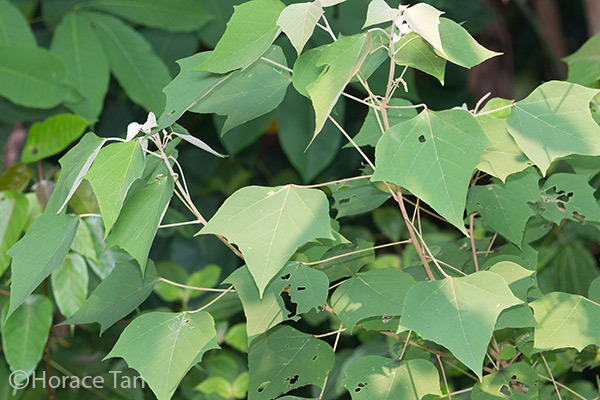 The common name "Turn-in-the-wind" comes from the fact that the long and slender petioles cause the leaves to twist even in slight breeze, showing the contrasting and whitish underside. 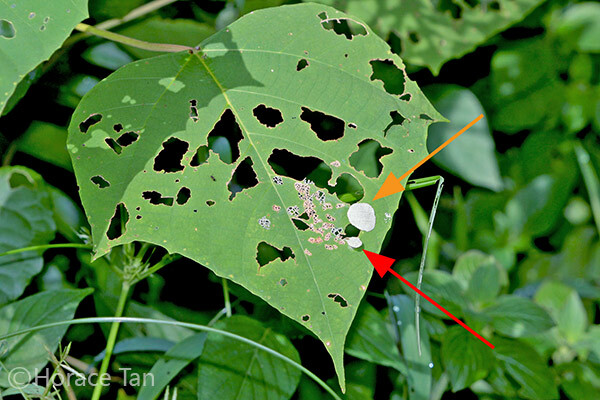 Leaf shapes are variable with leaf margin entire to irregularly dentate, sometimes 2-lobed. 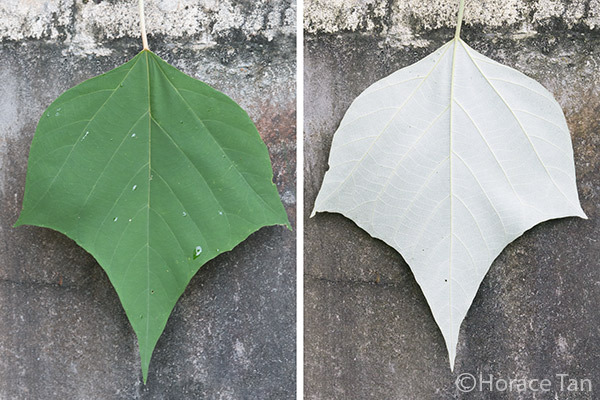 Left: leaf upperside; Right: leaf underside. Note the distinct contrast in colour between the two sides. Leaves of the Turn-in-the-wind, showing variable leaf shapes. There are two conspicuous nectary glands at leaf base on the upperside. 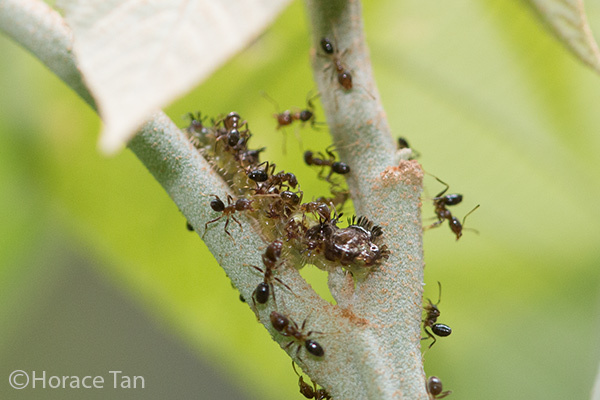 The nectary fluid from these glands is a food source for various insects visiting or resident on the plant. 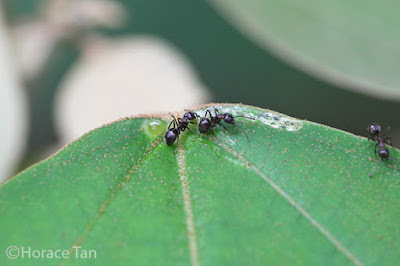 Ants attracted to the nectary glands at leaf base. 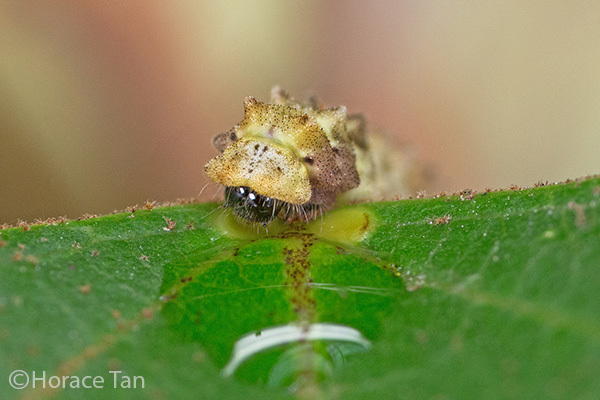 A final instar caterpillar of the Lesser Darkwing (Allotinus unicolor) enjoying the nectary fluid from the leaf glands. Turn-in-the-wind is usually dioecious (having separate male and female plants), but occasionally monoecious forms do occur. Flowers are placed in panicles (much-branched inflorescence) which occur either terminally or axillary. Staminate (male) inflorescences are up to 45cm long with side branches to 28cm long. Each branch has up to 70 nodes, each of which bearing 3 to 7 flowers. The male flowers are small with pale yellow sepals and yellow anthers. Pistillate (female) inflorescences are up to 30cm long and up to 75 nodes per branch. The female flowers are 3-4mm in diameter and have yellow style and yellow stigma. A male inflorescence of the Turn-in-the-wind, still at the flower-bud stage. Left: A male inflorescence with flowers in bloom. Right: Close up view of an individual male flower among flower buds on the same branch. A female inflorescence of the Turn-in-the-wind, still at the flower-bud stage. 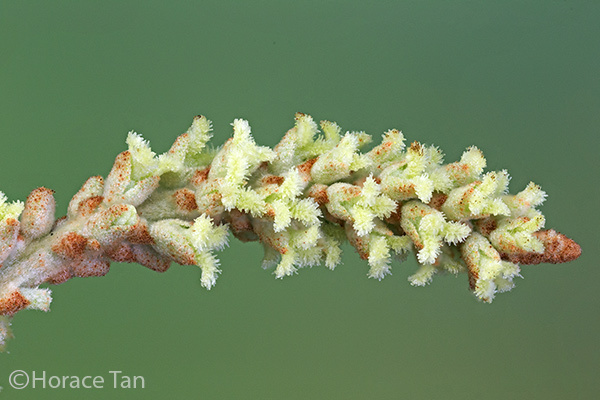 Part of a female inflorescence of the Turn-in-the-wind. 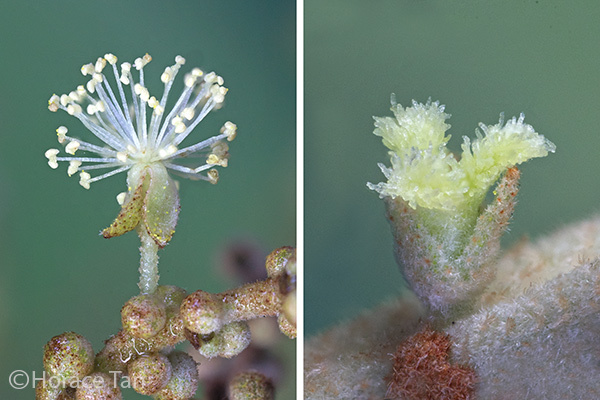 Close-up views of individual flowers. Left: male; Right: female. 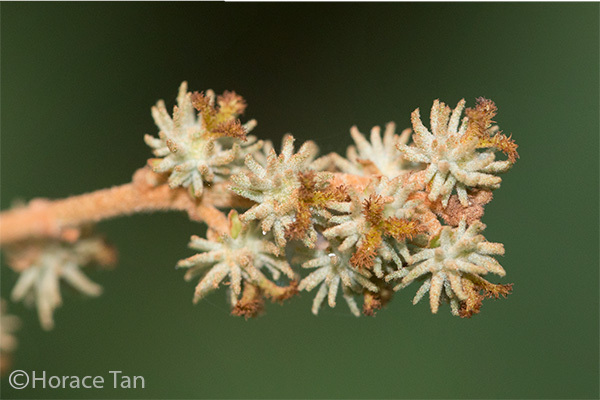 The 3-lobed fruits are greenish tawny and about 7mm in diameter. Each bears several hairy spines which are up to 7mm long. 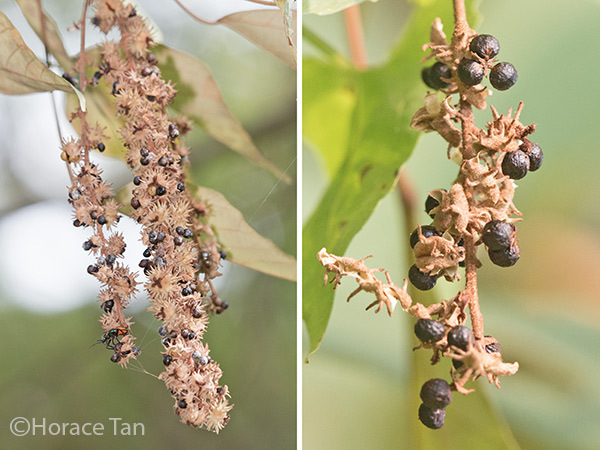 When ripened, the fruits split open to reveal small, globose seeds which are smooth and black. 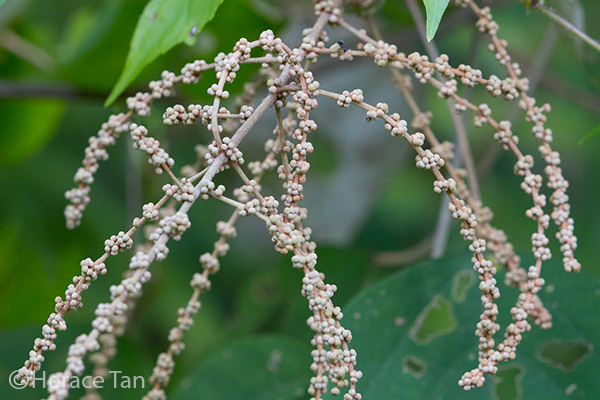 A fruiting tree of the Tunr-in-the-wind at Mount Faber Park. 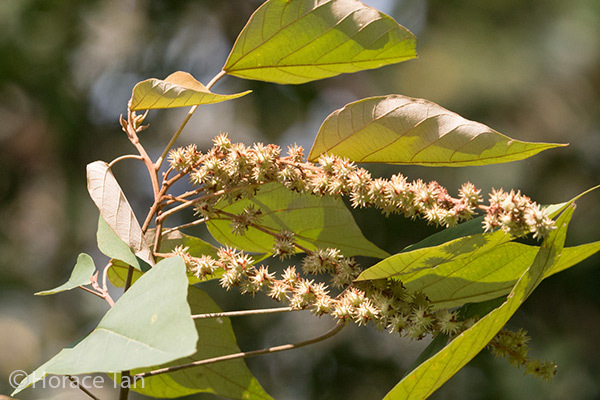 The massive occurrence of the fruiting inflorescences turns the tree brownish in appearance. Ripened fruits split open to reveal small, black seeds. In Singapore, Turn-in-the-wind also serves as the larval host plant for seven butterfly species: Megisba malaya sikkima (Malayan), Semanga superba deliciosa, Rapala pheretima sequeira (Copper Flash), Rapala dieneces dieneces (Scarlet Flash), Allotinus unicolor unicolor (Lesser Darkwing), Logania marmorata damis (Pale Mottle), and Mooreana trichoneura trichoneura (Yellow Flat). 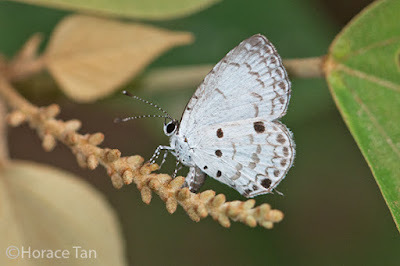 The first six are lycaenid species, while the last one is a member of Hesperiidae (subfmaily: Pyrginae). 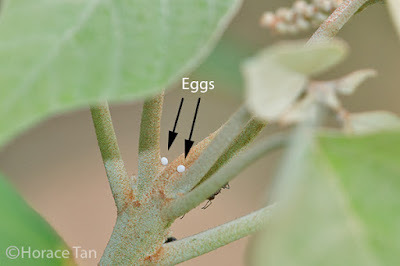 Eggs of the Malayan are typically laid among flower buds, whereas those for Semanga superba deliciosa, Copper Flash and Scarlet Flash are laid on young shoots. The Lesser Darkwing and the Pale Mottle are carnivorous species which feed on tree hoppers living on young shoots and inflorescences of the Turn-in-the-wind. Their eggs are typically laid at these sites and sometimes even directly onto the body of these scale insects. 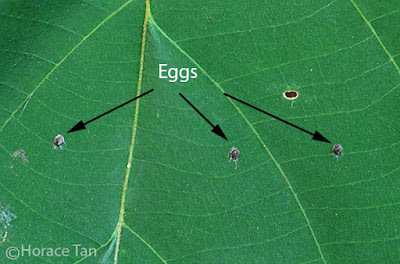 In contrast, the eggs of the Yellow Flat are laid on the upper surface of mature leaves, often concealed in a tuff of hair. 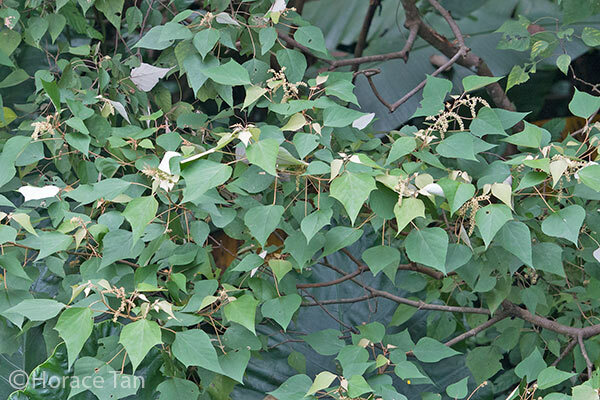 A female Malayan laying an egg among the female flower buds of the Turn-in-the-wind. 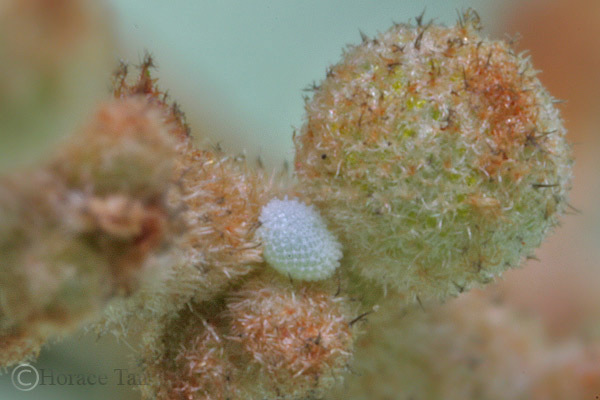 Close-up view of an egg of the Malayan laid between male flower buds of the Turn-in-the-wind. Eggs of Semanga superba deliciosa laids on the petiole base in a young shoot. Eggs of the Yellow Flat on the leaf upper surface. 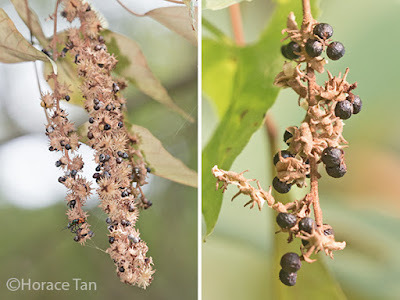 Caterpillars of the Malayan feed on flower buds and flowers on the flower/fruit inflorescences while those of Semanga superba deliciosa and two Rapala spp. feed on young leaves and shoots. 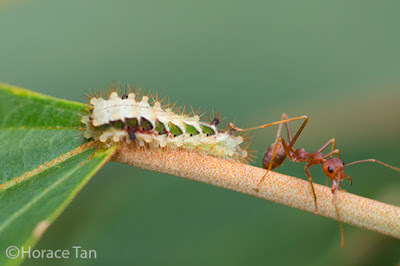 The two carnivorous spp. do not consume any plant parts but attack and feed on tree hoppers living on young shoots and inflorescences. 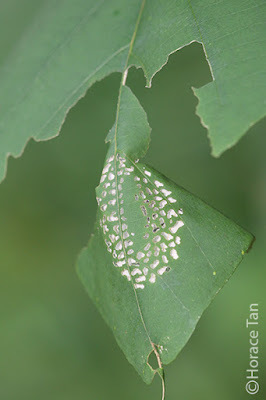 The caterpillars of the Yellow Flat feed on leaf blades as well but live in a folded-up leaf shelters on a chosen leaf. 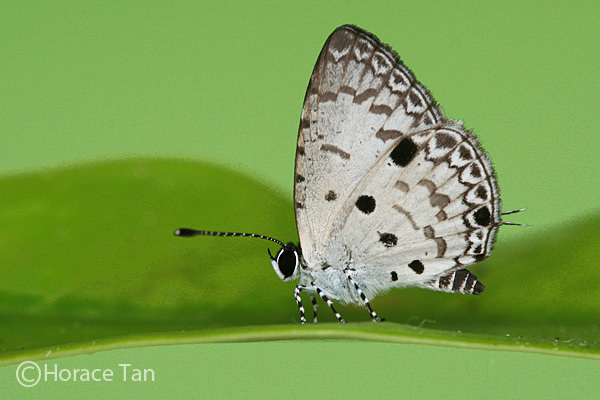 All six lycaenid species have nectary glands which attract ants to attend to them. 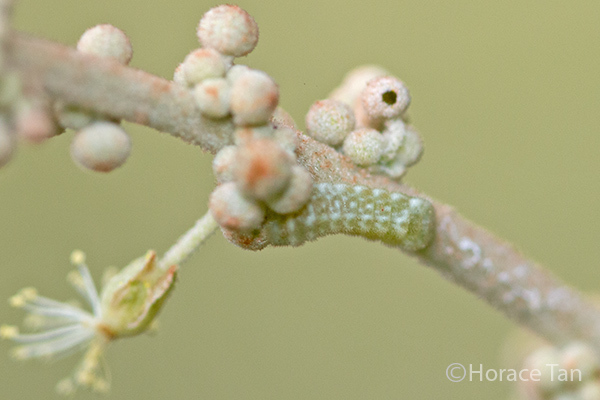 A Malayan caterpillar feeding on male flower buds. Another Malayan caterpillar feeding on male flower buds. 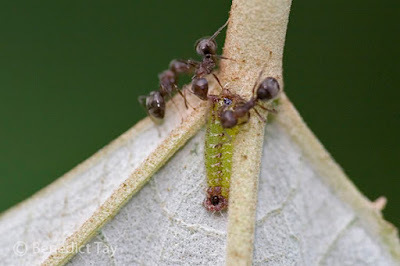 A Semanga superba deliciosa caterpillar being attended by several ants on the underside of a leaf. A Scarlet Flash caterpillar being attended by several ants on the stem of a young shoot. A Copper Flash caterpillar imbibing nectory fluid while being attended by a weaver ant. Leaf shelters of early star caterpillars of the Yellow Flat. 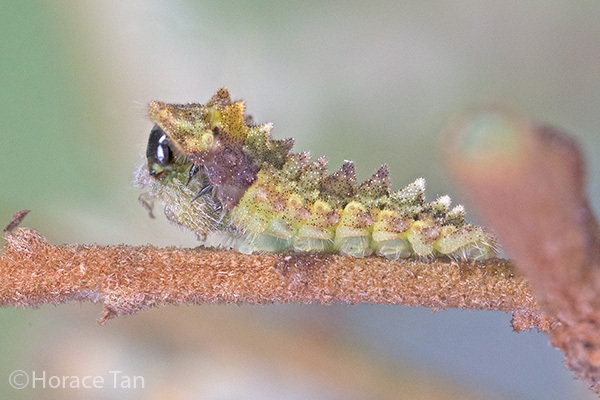 Leaf shelter of a final instar caterpillar of the Yellow Flat. 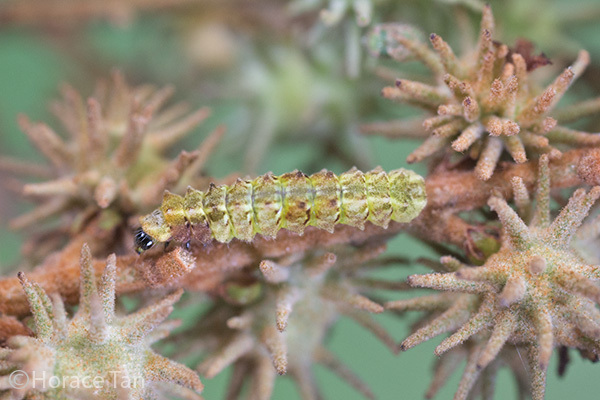 A Lesser Darkwing caterpillar found on a fruiting inflorescense. 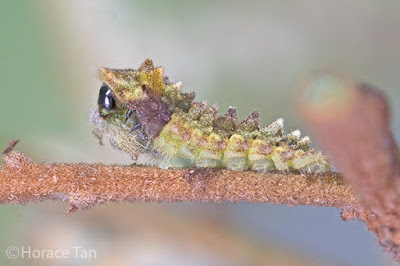 A Lesser Darkwing caterpillar eating a tree hopper. 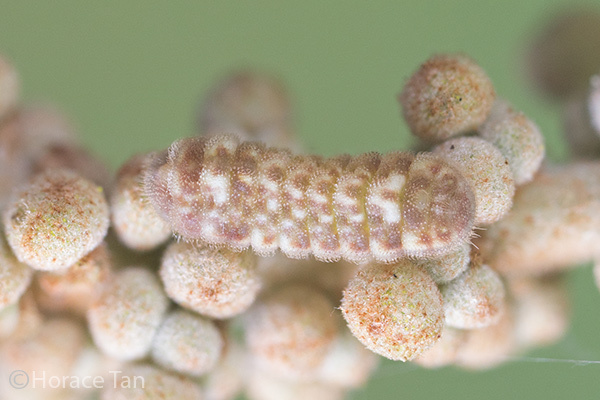 Caterpillars of the Malayan typically choose to pupate near its feeding site on the inflorescence. Those of other five lycaenid species, ie. Semanga, two flashes and two carnivorous species, typically choose to pupate on the leaf surface, usually on the underside. The Yellow Flat, being a skipper species, pupates within the final leaf shelter utilized. 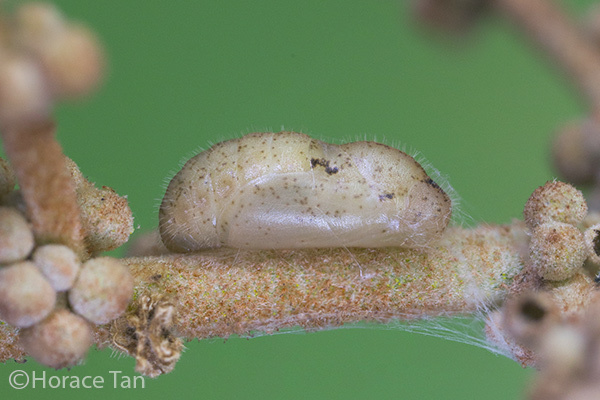 A pupa of the Malayan found among the flower buds of the Turn-in-the-wind. 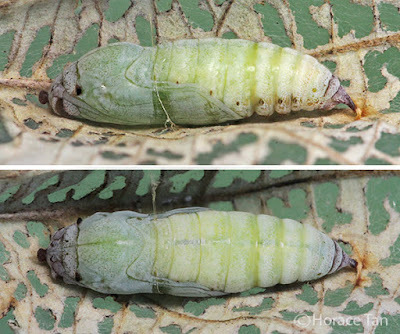 Two views of a pupa of the Yellow Flat within a leaf shelter on a leaf of the Turn-in-the-wind. 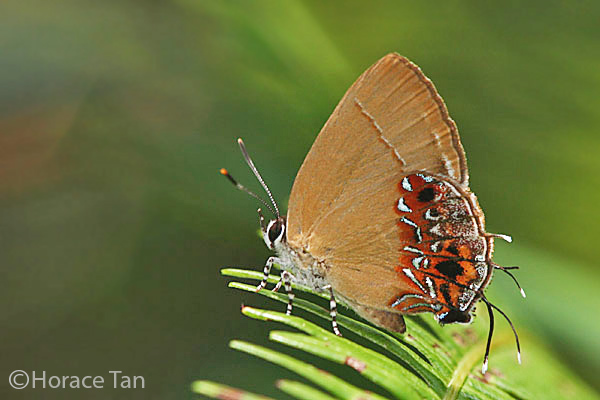 With so many butterfly species utilizing Turn-in-the-wind as larval host, this plant is always a worthwhile target to check out whenever you encounter one during a walk in parks and the nature reserve. 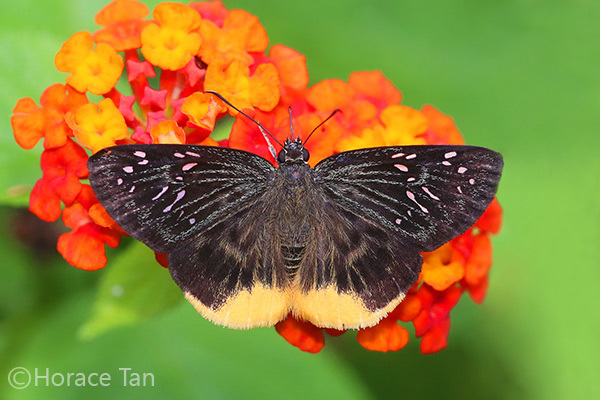 If luck is on you side, you might even find early stages of other butterfly species present, thus adding to the list of resident species on this amazing plant. 1001 Garden Plants in Singapore : Boo Chih Min, Kartini Omar-Hor and Ou-Yang Chow Lin, National Parks Board, 2nd Edition 2007. 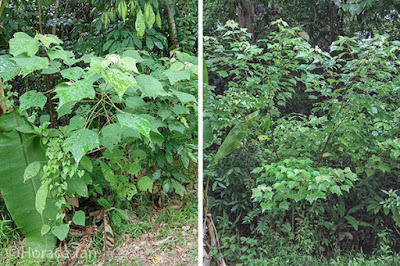 Mallotus paniculatus, Useful Tropical Plants.